The Edinburgh flanker has joined the Scots' lengthy injury list after breaking his hand. 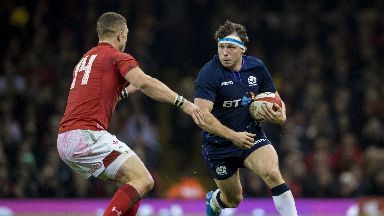 Edinburgh flanker Hamish Watson will miss the majority of the Six Nations after breaking his hand, Scotland head coach Gregor Townsend has confirmed. The open-side suffered the injury last Friday as Edinburgh beat Montpellier in the Champions Cup. Watson becomes the 20th name to be added to Scotland's list of sidelined players, which also includes John Barclay, Blade Thomson, Fraser Brown and the Fagerson brothers. The 27-year-old had established himself as a key performer for club and country, starting 11 of the last 12 Tests and helping Edinburgh reach the quarter-finals in Europe. "To lose someone like Hamish is disappointing," Townsend said. "But it is an opportunity for someone else." Glasgow pair Jonny Gray and Ryan Wilson are currently recovering from shoulder injuries, while Sam Johnson deals with concussion. Uncapped back-rows Luke Crosbie (Edinburgh) and Matt Smith (Glasgow) have been added to the squad along with forward Rob Harley and centre Alex Dunbar (both Glasgow) as Townsend looks for a new solution. The Scots open their Six Nations campaign by hosting Italy at Murrayfield on February 2, before champions Ireland visit Edinburgh a week later. Townsend insists it is not a given that his side will kick off with a victory against the Italian minnows. "The expectations in Scotland will be high, but we realise that it is a very tough game to start with," he added. "We have lost a number of times to Italy and we should have lost to them last year. "They are a very tough team to play against, and Scotland teams in the past have found it very difficult. "We are in it to win it [the Six Nations], and I imagine that is what every team is focused on. "Finding that consistency of good to very good performances is what is required from us to be tough to beat, and to win tournaments."